Home » Nails » Happy St. Patrick's Day from Red Carpet Manicure and B.I.O.A, of course! 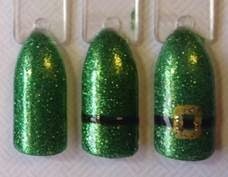 Happy St. Patrick's Day from Red Carpet Manicure and B.I.O.A, of course! It's so fun to experiment with colors and designs and this upcoming St.Patrick's Day- Red Carpet Manicure is offering two easy DIY designs. Apply 2 to 3 coats of "Emmy-rald Winner" curing after each coat. Using a striper brush, apply a thick line of "Black Stretch Limo" across the lower half of the nail and cure. Add a belt (square) over the middle of the black line using "I Am So Honored" and cure. Next, apply 2 coats of "My Lucky Charm." Paint a black pot on the bottom right of nail using the nail lacquer version of “"Black Stretch Limo." 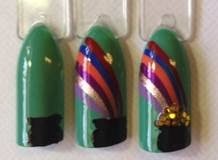 Then, using a striper brush, paint a rainbow using your favorite RCM nail lacquer shades such as orange "Flirt Alert," royal blue "RSVP," purple "9 Inch Heels," red "Red Carpet Exclusive," lavender "Romantic Comedy," or a metallic rose gold "Mink Coat." Add gold glitter pieces from RCM’s "Gems and Jewels - Golden Dust" collection to the top of the pot/base of rainbow.